To say that the social media game is easy to play is not only an understatement for those who are considering it seriously but it is also extremely hard to pull off. Especially if one is working without a social media scheduling tool. Marketers who decide to reduce their social media time by using a social media scheduling tool. So far, we’ve been writing about both types. We’ve written two blog post where we reviewed 20 social media scheduling tools for marketers to choose from. The first blog post was about the theory that one-size-fits-all doesn’t apply for every social media strategy. We’ve given more of a general overview for each of the 15 most popular social media scheduling tools on the market. The second blog post was about 5 social media scheduling tools that, according to our criteria, deserve their place on the A list. The number of customers, the specific features, the big names that are using them – they are all listed there. And yes, we may have been writing for both types of marketers, but we are secretly cheering for the second type – the ones that are working smart, not hard. The reason is simple – we are too the type of marketing agency that likes to work smart. But our journey wasn’t paved with rose petals. Even with all of these social media scheduling tools available on the market, something was always missing. Whether it was the lack of specific functionality, or slow customer support, or something else, we were just not happy with the outcome. However, we were determined to find the social media scheduling tool that would be the right fit for us, no matter what. And, after a certain period of time, our search brought us to the right social media scheduling tool – Populizr. Populizr is an application designed for every marketer, agency or enterprise to raise their presence on social media. It’s an all-in-one social media scheduling tool. But you’ve already heard that one before, didn’t you? There are plenty of other social media scheduling tools that present themselves as an all-in-one solution, some of them mentioned in this serial. You might ask what makes Populizr different than the rest? For starters, all its features are unique and designed to complement each other. Together, they create a social media scheduling tool that completely automates the process of posting on social media. This feature enables you to create a social media campaign out of your blog post. Scrape – The first step is taking the link of your blog post and copying it into the social media scheduling tool. It will take the original title and the meta description. Variations – The second step is making variations of that blog post. The variations are done on the title, the meta description, and the images. If you are not satisfied with the variations, you can alter them any way you see fit. Populizr offers 25 variations from a single blog post. Posting time – The third step is choosing when to post the variations. You can choose to ‘Post Now’ or to schedule it for later according to your brand’s needs. At this point, you are probably stuck on ‘Variations’. Right? Let’s mention that this feature is unique to Populizr. No other social media scheduling tool on the market has it, and it will be a huge help to your marketers. Well, since Populizr gives you variations of the title/meta description/images you don’t have to make these manually. This is how you avoid spamming your fans/followers on social networks. With this feature, your blog post gets a new title, meta description and new image for all your social sharing. And, even though your fans on, let’s say, Twitter and Facebook still get the same blog post they will not see it as spamming because it will be presented with different image/title/meta. Once you get the variations you can tweak them to your liking and you are done. There is also a possibility of Populizr WordPress plugin that works great too. It lets you choose any sentence from your blog post to use as a meta description. This is a huge time saver that helps any brand build a positive image with unique social sharing. One important feature worth mentioning here is Targeting. Populizr enables you to target the right audience for your content. You can use the ‘Target Audience Selector’ to choose the right time your audience is active the most. And not only that, you have several options to choose from which help you to really pinpoint your target group. Awesome! Using this strategy you are ensuring that your message gets seen by the right audience. This is how you will increase your engagement rates and overtime build brand awareness. After completing both of these steps, it’s time for you to see the third Populizr’s feature – ‘Insights’: the analytics of the posted content. If your social media team needs to have another set of social media scheduling tools for measuring results, what’s the point of having a social media scheduling tool in the first place? Luckily, Populizr offers ‘Insights’ – the analytics feature which can give you pretty good insights into your social media campaigns. 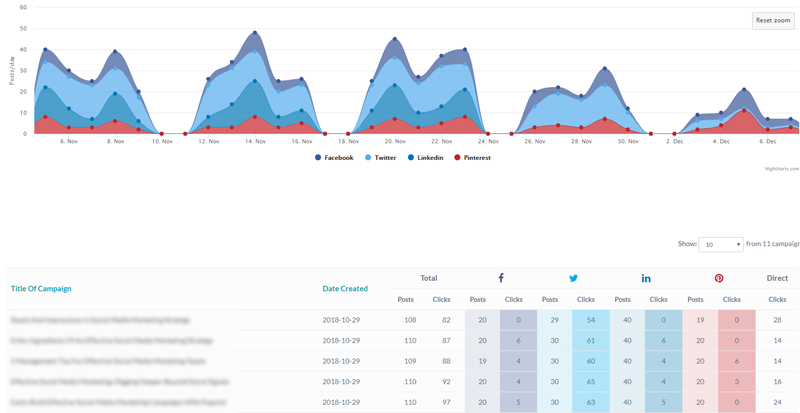 In one dashboard, you can see the number of posts that are posted on each social media network and how many clicks those posts have gained. These numbers can show you the engagement rates on each social network. Plus, you can see on which social network your brand is the most successful and focus your attention to those users. This way, you can see on which social network the audience is engaged the most. Your social media team can use this information to prepare a strategy that will improve or raise your social game. The ‘Demographic’ feature will show you, through a geographical view, where your audience is active the most. You can choose any campaign to see demographic analytics. Plus, you can see the analytics for every social network, or you can choose one social network and see the specific statistics for that network only. 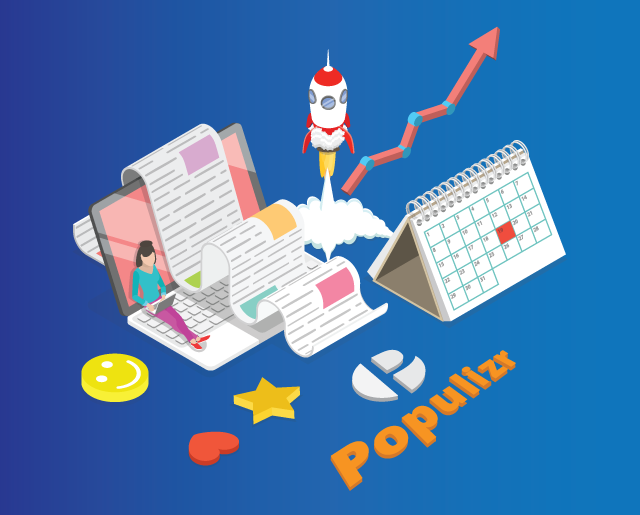 Basically, Populizr as social media scheduling tool gives you a complete insight into your campaign so you can modify it according to your users’ needs. Once you are done with analyzing and measuring the finished campaigns, don’t let a campaign go to waste – reuse it. That’s Populizr’s fourth important feature. Picture this: Your copywriters spend time and resources to create a blog post. It’s a good blog post, ranking high on Search Engines. Then, your social media marketers schedule that post with Populizr. The social media scheduling tool creates variations of it, and the campaign begins. After a while, the campaign is gone. Why would you let one successful social media campaign go to waste when it’s perfectly reusable? That’s what makes Populizr better than the rest of the tools out there. Their marketing and web developing team have thought about using the most out of one campaign. If you have a successful social media campaign and you don’t want it to go to waste, you can reuse it with this Populizr’s feature. With a single click, you can get your best campaigns right in front of your audience once again. This way it can reach an even broader audience, and you’ll know it will be successful because it already paid off in the past. All of these features are unique in one way or another, different from the rest social media scheduling tools available on the market. But with the last feature Populizr really stands out the most. If you’re having second thoughts about the importance of emotions in your marketing strategy, we advise you to read this blog post – to find everything you need to know about crafting emotional messages that will engage your audience. Back to Populizr, the social media scheduling tool that made all the difference for us. The built-in ‘Sentiment and Emotion Analyzer’ provides an analysis of the emotional impact of your content. Well, the Sentiment analysis provides three types of emotions your content is evoking in users – Positive, Negative, or Neutral. It’s okay if you always aim to create Positive sentiment, but that might depend on specific goals you are trying to achieve. Sometimes you will maybe want to use some negative emotions to push your audience out of their comfort zone to take certain action. This is why this analyzer is so important – it gives you a preview of the emotional impact even before your content is posted, and you will be able to tweak it until you are happy with the results. The second part – the Emotion analysis shows the percentage of words that convey a specific emotion among the users. The specter of emotions goes from happy to anger (with everything in between). You are checking or editing the variations for your social media networks. When you press on any title or meta description, on the right side of the text it will give you two analyzers – Sentiment and Emotion. The Sentiment Analysis will show which is the dominant sentiment in your variation: Positive, Negative or Neutral. The Emotions Analysis shows the exact emotions your variations are evoking among your audience. You can change the text in order to achieve a certain sentiment or emotion. Now this is really cool, isn’t it? This built-in analyzer was the feature that made a huge difference for us. We as marketers are well aware of the importance of emotions in each customer journey. And even with our ten years of experience in the industry, creating content with the right emotional message has not been an easy task. But that was before Populizr. Since we started using this social media scheduling tool, we have successfully managed to craft the content that evokes the right emotions for our target audience. And now, knowing the user’s emotions about our posts on social media has given us an unparalleled advantage before our competitors. We can use our posts to engage with our audience on a more personal level and to offer them a much better user experience. With Populizr as our go-to social media scheduling tool, we have experienced several other benefits such as creating content that’s in line with the user’s emotions. We also gained a better understanding and improved our knowledge about the customer. Well, by now, you are probably aware of why we have decided to pick Populizr as our No.1 social media scheduling tool. However, we need to clarify the details around that choice, and hopefully, we will come through to you why this social media scheduling tool is our top choice. Why The WebMaxFormance Team Picked Populizr As Our No.1 Social Media Scheduling Tool? When looking for the right tool, one can easily get overwhelmed with all that is available on the market. All of the tools out there boast with these incredible features which can fulfill all your marketing needs and then some… The reality is different though. It can happen that you have to spend more time learning and navigating those tools then it is necessary to be time efficient. And to pay big for some extra features you will never use. That is why, for us, Populizr works the best. We believe that the point of a well-balanced tool is to have the necessary features needed to do social media management work. And Populizr offers just that – the right amount of features to do the work it was built for. Let’s remind you, the app has a user-friendly interface so your team can start creating their social media campaigns right away. It’s well organized, easy to manage and available for marketers, agencies, and enterprises. It is also cost-effective and gives your brand a chance of spending just 4 minutes per campaign to gain the social media presence your brand needs. Isn’t that awesome? Plus, the Populizr’s team has done a great job creating a proficient video Knowledge Base so you can see how every feature works and spend just a few minutes on it. Currently, Populizr works with Facebook, Twitter, Pinterest, and LinkedIn. Populizr helped us increase our social presence, increase engagement rates, and increase the number of quality leads. But perhaps the most important benefit is that Populizr with its Sentiment and Emotion analyzer has helped us better understand our audience. Creating content that corresponds with our brand’s needs is relevant, but being able to be in-line with customer’s emotions is even more important. For all these reasons we strongly recommend Populizr. It will help you manage your social media marketing team, create successful social media campaigns and connect with your audience on a more personal level. Check the social media scheduling tool and enjoy all the benefits it offers.